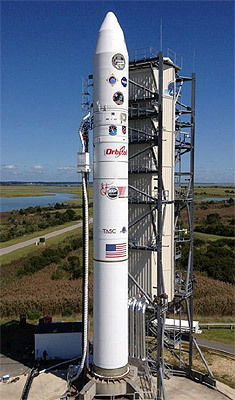 The most recent addition to Orbital's line of space launch vehicles, the Minotaur-4 (a.k.a. OSP-2 Peacekeeper SLV) combines elements of government-furnished decommissioned Peacekeeper missiles with technologies from our proven Pegasus, Taurus and OSP Minotaur boosters. The vehicle consists of three Peacekeeper solid rocket stages, a commercial Orion-38 or a Star-48BV fourth stage motor and subsystems derived from established space launch boosters. Under a 10-year contract with the U.S. Air Force Space and Missile Systems Center, Orbital will develop and operate the low-cost Minotaur-4 vehicle to launch U.S. government-funded satellites into low-Earth orbit. The Minotaur-5 is a version of the Minotaur-4, which features an additional upper stage for high-energy orbits like geostationary transfer orbits or interplanetary trajectories. The Minotaur-6 is a Minotaur-4+ stretched by another SR-118 first stage. The Minotaur-3 suborbital launch vehicle provides the ability to deliver payloads up to 3000 kg on long range, suborbital trajectories for various U.S. Government-sponsored applications. It utilizes residual Peacekeeper solid rocket motors combined with Orbital's commercial launch vehicle technologies. The Minotaur III is designed to be adaptable to a variety of potential payloads. 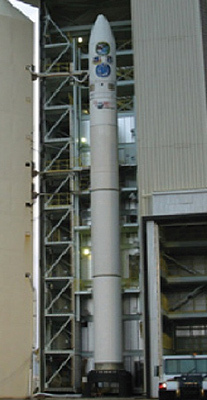 A mono-propellant hydrazine propulsion fourth stage called Super-HAPS provides precision trajectory control to support the high-accuracy delivery of target or reentry systems for technology demonstration. Multiple adapters and separation systems enable a variety of options for payloads. 7    1    Minotaur-4 Orion-38     26.08.2017  CC SLC-46        ORS 5 / DHFR / Prometheus 2.2 ? / Prometheus 2.4 ?